The AC sensor is a hand-held device for determining the presence or absence of AC voltage in insulated wires, wall receptacles, fuses, junction boxes, switches, and any other voltage-carrying electrical systems. The AC sensor is a hand-held device for determining the presence or absence of AC voltage in insulated wires, wall receptacles, fuses, junction boxes, switches, and any other voltage-carrying electrical systems. It can show whether the case of an appliance is hot. The AC Sensor determines defective grounds, reverse polarity, and induced voltage. It is not necessary to disconnect the system in question, because no contact is required for operation, and current flow is not necessary to locate voltage. 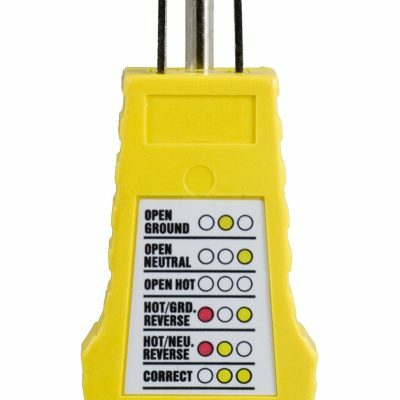 Simply touch the plastic tip to a connection point or move it along an insulated wire. If AC voltage is present, the LED light in the probe tip will glow bright red. The illumination will stop at a break in the circuit or wire. The instrument is so sensitive in locating voltage that it will react to static electricity by flickering. 2 AAA batteries included.